The United States Constitution was adopted by Congress on September 17, 1787 in Independence Hall, Philadelphia, Pennsylvania. 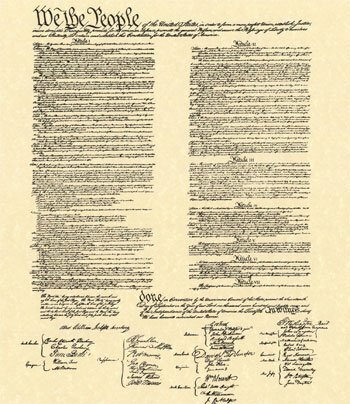 It is the single most significant document that shaped, and continues to shape, the frame of government in America-- designed to deliberately balance the role of legislative, judicial and execute branches of government for the will of the people. The document is structured with a "Preamble" which states its fundamental purpose and guiding principles, followed by seven "Articles." Article V of the Constitution specifies how the frame of government may be altered in the form of constitutional amendments. As of 2016, there are 27 amendments which have been ratified, the first ten of which were adopted and simultaneously ratified on December 15, 1791 by The First Continental Congress and three-fourths of the State legislatures, known collectively as the U.S. Bill of Rights. As of 2016, twenty-seven Amendments to the U.S. Constitution have been successfully ratified, an additional six were passed by Congress, but failed to be ratified by the required majority of State legislatures. Here is a summary of the Amendments to the U.S. Constitution. You may also enjoy reading the nation's formative document to establish the new country's infrastructure, The Federalist Papers. Visit American History and the African American Library for other important historical documents and to learn about the people which helped shape the country.